The cottage is situated in the countryside with easy access to several roads to Stockholm City, Uppsala, Norrtälje, Åkersberga, the Coast of Roslagen, Sigtuna etc. It's within 10-15 min walking distance to the highly ranked golf course Ullna GC and Arninge GK. Its a 2 storey modern guesthouse built in 2003, with a fully equipped kitchen / diner / dishwasher / fridge / freezer / espresso machine / coffee-brewer, bathroom with shower and washing machine downstairs and an open plan livingspace upstairs, divided into a livingroom with a wide sofabed and a single bed, a sleeping area with 2 single beds (can put together to a double bed) and a dressing area, all in all 40 sq. meters. Outside the entrace on the lower floor you've got tables and chairs where you can enjoy your breakfast or lunch in the sun and on the upper floor outside the patio. 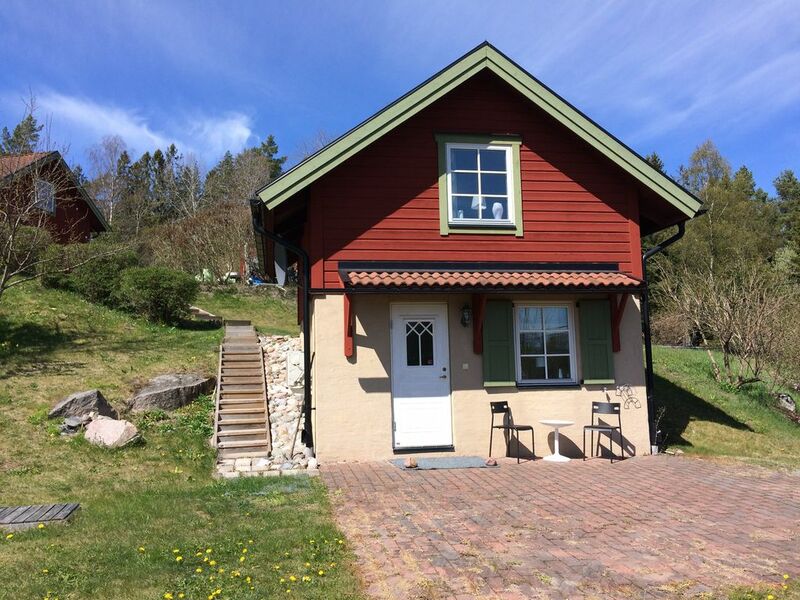 It's the perfect holiday cottage for exploring the surroundings, the archipelago, fishing, walkingtrails, biking, boating and of course golfing, or go shopping in Stockholm City or any of the close coastal towns / villages. To get around here you will need a car. There are buses but not very frequent. Guests have the possibility to order freshly baked breakfastbread / sweets in the mornings, baked by us in the mainhouse. The guest house was very easy to find and not far from Stockholm at all by car! Martina and Anders were extremely helpful with advice on things to do in and around Stockholm. The advice and suggestions were invaluable with public transportation especially. They even gave us tips for the other places we were going to stay at in Sweden! The cottage was small and perfect for us. Kitchen worked great and the beds were comfortable. Definitely recommend for anyone who wants to be disconnected from the web and just enjoy the beauty of the Swedish landscape. The walk to and around the lake was very enjoyable. If we find ourselves in the Täby/Stockholm area again, we would definitely stay again! Martina and Anders were fantastic hosts! The house was clean and had everything we needed. Our hosts were extremely welcoming and helped us with advice on day trips. They were very thoughtful and leant us some toys for our toddler. The house was clean and tidy and had everything we needed. The spiral stairs were a little tricky though! Great place! Great hosts! Country living but close to Stockholm. It was a very nice house in the surrounding of Stockholm (20min by car) in between 2 golfcourses. The owners (Martina and Anders) were very friendly. Their hospitality was great. We do recommend this place if you want to visit Sweden. We were greeted by Martina and Anders with smiles and notes on what to see around the area and around Sweden in general. They had baked us treats and had them in the house and again when we left for our flight. Right next to a lake and not to far from entertainment in surrounding areas. We felt very welcome and very well taken care of. It was the perfect quiet get away after spending a week in busy Stockholm. The house was great, but our experience was made even better by our hosts! Thanks Martina, Anders, and Hugo!